I just released another version of my Image Resizer. Here’s a screenshot. As you can see, there are a couple of new features. 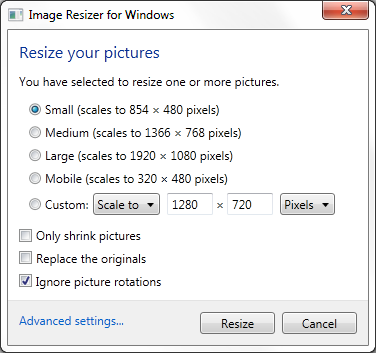 You can select a resize mode of either Scale to or Stretch to (for those who don’t care about maintaining the aspect ratio of their pictures). You can select a size unit of Pixels, Centimeters, Inches, or Percent. The new Ignore picture rotations setting at the bottom is handy for resizing a bunch of mixed-orientation pictures that you took with your camera. Before when you resized the portrait-oriented pictures would end up being smaller than the landscape-oriented ones. With the new option checked, both landscape and portrait pictures will end up being the same size. There are also a few performance improvements and bug fixes in this release. For full details, be sure to check out the release page.